Israelis are at the polls today to vote in a critical legislative election — the 22nd since the country's founding in 1948. Why it matters: Today's vote is widely seen as a referendum on Prime Minister Benjamin Netanyahu's 13 years of rule, with the last 10 running consecutively since 2009. 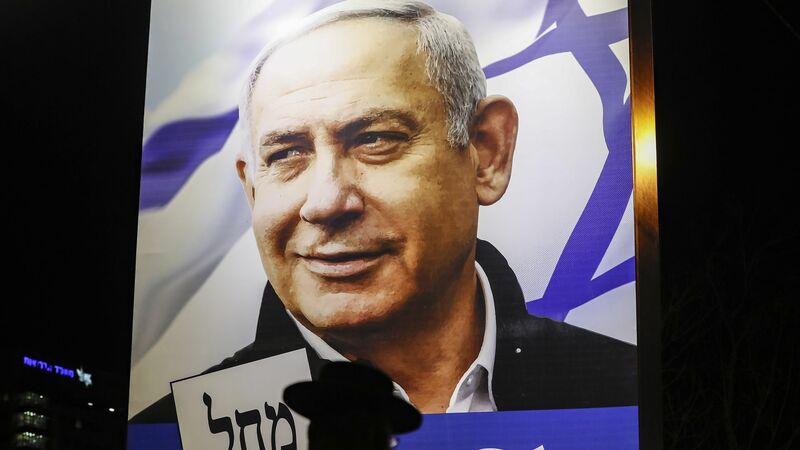 This year's elections were called early due to fractures within Netanyahu's ruling coalition, and they come as the prime minister faces pending indictments for bribery, breach of trust and fraud. What to expect: The centrist Blue and White party led by retired Gen. Benny Gantz is expected to win more seats in the Knesset, but Netanyahu and his right-wing Likud party have better odds of forming a majority coalition — likely an ultra right-wing bloc that would allow him to stay prime minister regardless of the indictments. The voting will end on Tuesday at 3 p.m. ET, at which point the 3 main Israeli television channels will publish their exit polls. According to Israeli law, it is forbidden to publish polls in the last 5 days before the elections. The polls published last Thursday and Friday were inconclusive and contradictory, with many voters remaining undecided. The backdrop: The election campaign was the dirtiest and most negative in Israel's history, sharing a number of similarities to the 2016 U.S. election. Gantz's mobile phone was allegedly hacked by Iran. It happened before the race started, but reports of the hack were leaked in the middle of the campaign and prompted rumors on social media and right-wing outlets that Gantz had embarrassing personal videos on his phone. Netanyahu used the story about the hack to attack Gantz and claim that the Iranians could blackmail him if he were elected. Gantz, on the other hand, claimed Netanyahu was behind the story's leak, and he even hinted that Netanyahu might have been behind the hack itself. After Gantz gave several TV interviews in which many believed he looked lethargic — and after a recording leaked of Gantz speculating that Netanyahu could try to kill him — Netanyahu's team started claiming, including in campaign ads, that Gantz was mentally unstable. Meanwhile, Gantz and his party claimed Netanyahu tried to profit off a multibillion-dollar submarine deal between Germany and Israel, and that he harmed Israel's national security when he green lit another submarine deal between Germany and Egypt without discussing it with his security chiefs — again, allegedly in pursuit of financial profit for himself and several of his confidants. Several foreign countries also exerted influence in the final stretch of the campaign, mainly to help Netanyahu. 2 weeks before the elections, Netanyahu met President Trump at the White House for a ceremony in which Trump signed a proclamation recognizing Israel's sovereignty over the Golan Heights — a major foreign policy win for Netanyahu. Netanyahu used this move specifically and his close relationship with Trump in general as a main theme throughout the campaign. Less than a week before the elections, Netanyahu was invited by Russian President Putin to Moscow after Russian soldiers in Syria recovered the body of an Israeli soldier who had been missing for 37 years. The Russians even held a memorial service for the soldier in Moscow with Netanyahu attending. This was seen as another big foreign policy win for Netanyahu and a clear endorsement by Putin. The other side: French President Emmanuel Macron invited Gantz's political ally Yair Lapid for a meeting at the Élysée Palace 5 days before the elections in what was perceived as an endorsement of the Blue and White party. The bottom line: Although it's likely that Gantz's party will win the most parliamentary seats, it will be met with the almost impossible task of trying to form a coalition. Gantz hopes to get at least 5 seats more than Netanyahu so that his victory will be perceived as a knockout and convince several right-wing parties to enter his coalition — but the chances of that are very low. It's more likely that even if Netanyahu gets fewer seats than Gantz, he will still be able to hold his right-wing coalition together and continue to govern Israel through a crucial period in the country's history.